With this week’s release of Wilco (The Album), there’s no better time to reconsider Wilco’s steady progression from scrappy alt-country forebears to kings of the AAA charts. 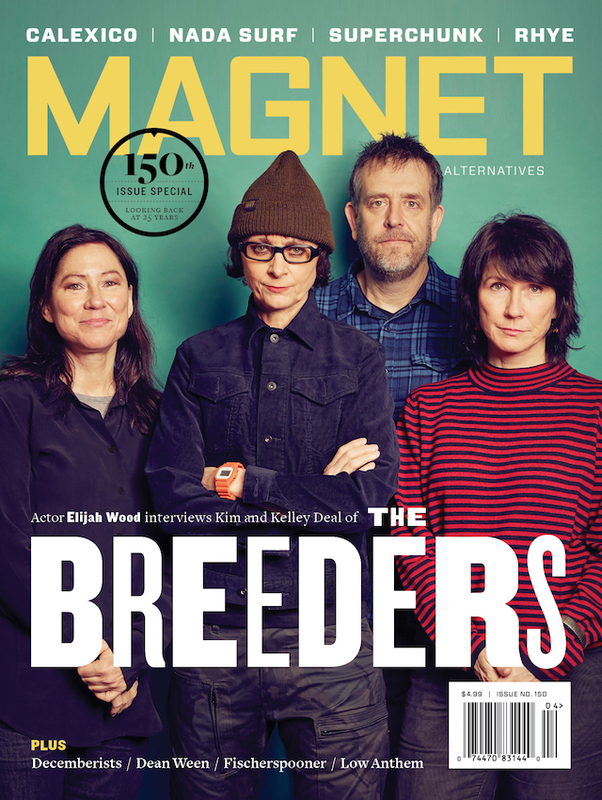 Since each of Wilco’s studio albums has been pored over, criticized and deconstructed countless times, MAGNET’s Matt Siblo looked toward the band’s output on film. Watch as Jeff Tweedy can’t afford to buy Wendy’s for his hungry child! Marvel at guitarist Nels Cline’s inability to wear pants that cover his socks! See the Tweedy household and all of its bric-a-brac! And wonder at who’s been supplying this band with such awful beanies for the past decade. 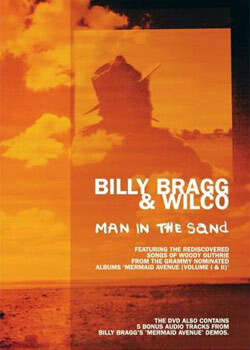 Today’s feature: 1999’s Man In The Sand with Billy Bragg. This documentary, filmed for the BBC, captures the famously contentious union of Wilco and Billy Bragg working on what would become Mermaid Avenue volumes one and two: the two camps’ musical imagining of Woody Guthrie’s unused vault of lyrics. The film primarily focuses on Bragg’s earnest and diligent quest to do right by his hero, as he seeks out every nook the freewheeling Guthrie ever hung his head in search for inspiration and guidance. A ramshackle Being There-era Wilco doesn’t make its presence known until halfway through the movie, where we find Tweedy in enfant-terrible mode, trading barbs with Bragg about how “the fascists are really going to get what’s coming to them” with this record. Even the goofiest footage is laced with a thick sense of tension, and it’s clear that the two artists are coming from very different places in terms of their participation. Bragg describes “a search for Woody Guthrie.” When prompted for his impression of the singer, Tweedy remarks that he’s always thought of him as a “rugged little hobo.” The actual conflict that arises in post-production between the two parties goes largely unseen, with only a few hushed conversations over remixes and track lists and minor quibbles over songwriting credits that hint at the simmering animosity. When asked to reflect on the experience at the end of the film, Wilco makes a show of only giving “diplomatic” answers. Those interested in gaining the whole (mostly uninteresting) story should look toward Greg Kot’s Learning How To Die for the blow-by-blow. But considering Tweedy describes his working with Bragg going “almost as well as Uncle Tupelo,” the abridged version speaks volumes. A decade removed, the project now feels like a missed opportunity. Its conceit seems better suited to a contemporary Wilco lineup (the band recently released a cover of Guthrie’s “Jolly Banker”) as opposed to Wilco circa 1997, when Tweedy, desperate to shed his alt-country skin, can be seen wincing behind a massive American-flag backdrop. Come for the fresh-faced, semi-argumentative Wilco, stay for an uncomfortable two minutes of Bragg canoodling with Natalie Merchant. Blink and you’ll miss future This American Life contributor/Pilgrim historian Sarah Vowell making a brief cameo interviewing Tweedy about his role in the making of the album.